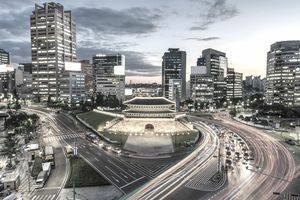 South Korea's booming, with a gross domestic product (GDP) that grew from $901.9 billion in 2009 to over $1.53 trillion in 2017, and that growth appears to be ongoing. The country's gross domestic product represents 2.47 percent of the world's economy. The GDP represents a measure of national income and output for South Korea. South Korea's economy ranks 11th in the world by nominal gross domestic product (GDP) and 12th by purchasing power parity (PPP). But perhaps most importantly for investors, the economy is viewed as both a stable high-income developed country and a member of the Next Eleven countries, signaling strong growth potential over the coming years. Despite almost no natural resources and overpopulation, the country has consistently boasted one of the world's fastest growing economies and is now the seventh largest exporter and tenth largest importer in the world. The majority of these exports are to the automotive industry, including Hyundai Kia Automotive Group, as well as consumer electronics. South Korea has a very attractive economy for international investors, given its rare combination of stability and rapid growth rates. But, there are also many risks that investors should consider before committing capital to the region, including geopolitical risks with its neighbor to the north and export-related risks that could hit during the downturn. Rapidly Growing. South Korea's economy is expected to grow at a rate of 3.9 percent to 4.2 percent per year between 2011 and 2030, along with most Next Eleven countries. Stable Economy. South Korea's economy is a member of the G20 as an OEDC nation, with per capita income of more than $30,000, meaning it's very stable. Geopolitical Risk. South Korea is situated in one of the most militarized regions in the world, with a very unstable neighbor in North Korea. Reliance on Exports. South Korea's economy relies heavily on exports, which can be detrimental when the global economy is contracting. The easiest way to invest in South Korea is with exchange-traded funds (ETFs) that provide instant diversification in a single security traded on a U.S. stock exchange. The iShares MSCI South Korea Index Fund (EWY) is the most popular South Korean ETF with a $2.85 billion net asset value and 106 holdings, as of October 2012. While the fund's expense ratio is only 0.59 percent, investors should be wary of its 21.9 percent exposure to Samsung Electronics and somewhat overweight exposure to the Information sector at 32.44 percent. American Depository Receipts (ADRs) represent another way to invest in South Korean companies without venturing outside of the United States. These ADRs enable investors to purchase foreign companies on a U.S. stock exchange, but may not be as liquid as many other U.S. stocks, and should, therefore, be traded with some caution. South Korea's economy has attracted investor interest given that it's both rapidly growing and highly developed as a member of the G20. The easiest way to invest in South Korea is using either ETFs or ADRs, which offer diversified exposure that can be purchased on a U.S. stock exchange. While South Korea has many solid benefits, investors should be aware of the geopolitical and other risks that it faces.